Study identifies previously unknown mechanism of the immune system. Generally, researchers divide the human immune system into two parts. One part, called the innate immune system, allows for immediate and direct recognition of invading bacteria. It prompts immune cells to kill, eat and degrade the microbes and triggers inflammation to fend off their attack. This activity alerts the body’s second line of defense, the adaptive immune system, which includes production of antibodies. Now, a study from researchers at Cedars-Sinai identifies a metabolic enzyme, hexokinase, found in all human cells that alerts the body to invading bacteria and jump-starts the immune system. The team state that their findings help explain how the immune system knows certain bacteria are harmful and, they may also shed light on why common health conditions such as obesity, Type 2 diabetes and coronary artery disease often are accompanied by inflammation. Previous studies show that decoding how the immune system works is one of the most urgent lines of inquiry in medical research today. Hexokinase is not a protein specific to the immune system. It is known to be a common enzyme necessary for cells to use glucose as a source of energy, with all cells containing hexokinase as it’s required to make energy. The current study shows a dual role of this enzyme in metabolism and innate immunity. The current study shows that hexokinase binds to a sugar in peptidoglycan, a chemical compound in cell walls of many harmful bacteria. Results show that this binding action triggers the activation of protein complexes that direct strong inflammatory responses against bacteria. The lab note that although the research was performed largely in cells from laboratory mice, they later found similar mechanisms operating in human cells. To explore a possible link between metabolism and inflammation, the researchers used chemical means to disrupt metabolism and interfere with hexokinase’s function in mouse cells in a petri dish. Data findings show that this disruption was enough to activate the bacteria-fighting protein complexes. The team state that while the exact mechanism was not clear, their results suggest an intriguing relationship between cellular metabolism and inflammatory signalling. The group state that the discovery of hexokinase’s two functions has far-reaching implications. They go on to add that it may help explain why chronic, low-level inflammation often is found in patients with obesity, Type 2 diabetes and coronary artery disease. They hypothesize that these serious conditions, which affect millions of Americans, are intertwined with metabolism, the chemical processes by which the body uses food and other substances to make energy, grow and heal. The team surmise that their findings altering a metabolic process causes inflammation may have profound implications for diseases, including diabetes, obesity, atherosclerosis and inflammatory bowel disease. For the future, the researchers state that they are continuing their research so they can learn exactly how the enzyme activates inflammation. Degradation of Gram-positive bacterial cell wall peptidoglycan in macrophage and dendritic cell phagosomes leads to activation of the NLRP3 inflammasome, a cytosolic complex that regulates processing and secretion of interleukin (IL)-1β and IL-18. While many inflammatory responses to peptidoglycan are mediated by detection of its muramyl dipeptide component in the cytosol by NOD2, we report here that NLRP3 inflammasome activation is caused by release of N-acetylglucosamine that is detected in the cytosol by the glycolytic enzyme hexokinase. 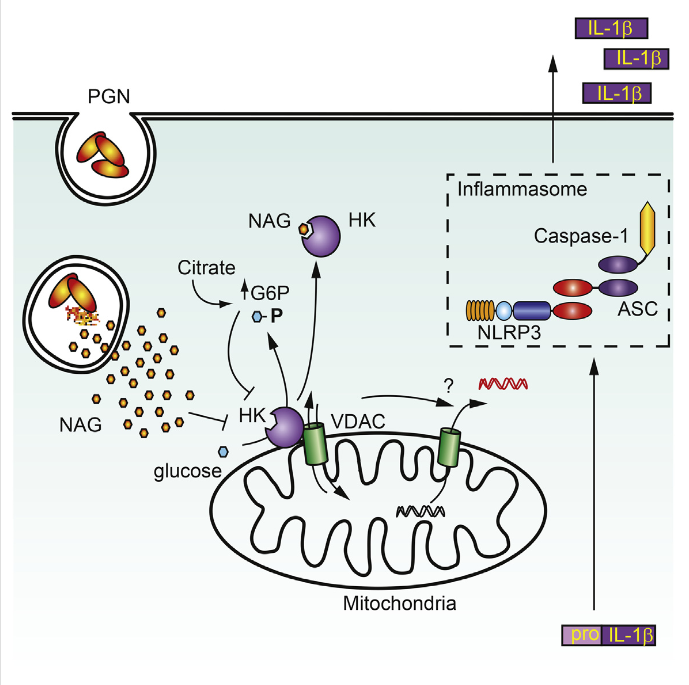 Inhibition of hexokinase by N-acetylglucosamine causes its dissociation from mitochondria outer membranes, and we found that this is sufficient to activate the NLRP3 inflammasome. In addition, we observed that glycolytic inhibitors and metabolic conditions affecting hexokinase function and localization induce inflammasome activation. While previous studies have demonstrated that signaling by pattern recognition receptors can regulate metabolic processes, this study shows that a metabolic enzyme can act as a pattern recognition receptor. Hexokinase Is an Innate Immune Receptor for the Detection of Bacterial Peptidoglycan. Underhill et al 2016.